Value for money, great location if you want to be in the Gachibowli area. The room is not what I expected, based on photos seen on Hotels. com. The rooms and surrounding spaces are poorly lit and virtually no ventilation. The wifi service is excellent. The food is not bad...hot meals provided. The staff are helpful. But overall the experience is not satisfactory. Located in HITEC City, this apartment building is within 1 mi (2 km) of Mindspace IT Park and Cyber Towers. HITEX Exhibition Centre is 2.4 mi (3.9 km) away. Very close to airport and great staff. Excellent room service. Excellent service Very secure I liked the 24hr gym. 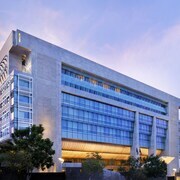 You'll find plenty of places to stay in Hyderabad with 513 hotels and other accommodation options including 15 apartments. While you're here, why not visit the shops and enjoy the lakeside? Charminar and Birla Mandir Temple are top attractions worth a visit. Why choose an apartment over a traditional hotel room? Apartments are ideal for families who want the conveniences of home, and also for couples looking for something with a more local feel. Though weather is just one factor, it can impact your holiday, especially if you're planning for a longer stay. And since apartments often have more rigid cancellation policies, it might be good to familiarise yourself with these weather averages before you book your trip. Hyderabad is known for its lakeside and shops. Cultural attractions include Salar Jung Museum and A.P. State Museum, whereas Lumbini Park and Hussain Sagar Lake are a couple of picturesque spots to enjoy the outdoors. You can also visit some other popular places in town including Charminar and Birla Mandir Temple. Fly into Hyderabad (HYD-Rajiv Gandhi Intl. ), which is located 10.1 mi (16.2 km) away. If you'd like to venture out around the area, consider renting a car to take in more sights.